Standing in the rain, gazing, digesting the night. All photos by Boris Ebzeev. Background info is big. It turns an ordinary stroll into a history walk. Good meals into culture lessons. And sips of wine into moments of appreciation of art and science. In the spirit of learning, Gentedimontagna interns Daniel Schwartz, Alison Weissbrot, and Boris Ebzeev took a field trip to Brooklyn for an evening tour of Dumbo with , an all-purpose lifestyle website run by locals. After many drinks, they have a lot to say about the neighborhood's history, 21st-century nightlife, and 20th-century industrial charm. DUMBO, Brooklyn – Let's review what you need for the best night ever in Dumbo. Forty years ago: a handgun. The neighborhood was dangerous and a hotspot for mob activity. Ten years ago: a better party plan. Luxury lofts and remodeled factories were on the rise, but after-hours appeal was low. Good bars and restaurants were scarce in Dumbo. Today: a few suggestions and good balance. Good luck pecking at Belgian cobblestones in high heels after a dozen well-poured drinks. Walk toward the water in Dumbo, and your mind will wander back in time. I'm unsure whether it's the red-brick warehouses or the two looming bridges, one on each shoulder, or the chiaroscuro of cobbled streets that lend the neighborhood the effect, but history is absolutely palpable. From the mid-1800s until the 1930s, the district commanded manufacturing in Brooklyn, once the fourth-largest industrial center in the United States, due to the slew of firms that moved in to access shipping on the river. Robert Gair invented the pre-cut cardboard box on Washington Street. Brillo and Domino branded the waterfront with their facilities. The well-preserved shells of these production houses still dot the streets, standing testament to the heyday of Brooklyn's industrial glory, but assembly lines no longer run in Dumbo. From on high, Brooklyn's manufacturing prowess slowly seeped across the Hudson, down the Eastern Seaboard, and across the country to plots with cheaper land. Deindustrialization left Dumbo with derelict buildings and barren streets. Many people worked here, but few ever lived here. Those that remained experienced the nocturnal energy that replaced the daytime hustle and bustle. Drugs, unkempt infrastructure, and organized crime turned Dumbo undesirable. The exodus left Dumbo to Jehovah's Witnesses. The denomination moved to Brooklyn in 1909, proclaimed the iconic Watchtower building its headquarters, and bought upwards of 30 properties in the Dumbo/Brooklyn Heights area for members and visitors. With industry gone, they became the primary land owner in town. Until the late 1970s when David Walentas started gobbling up the neighborhood. Under the shadow of his , former Witness properties and refurbished warehouses became carving blocks for large lofts, tech incubators, art spaces, and luxury condos that propelled the cost of living and livability to Manhattan-levels. Today, a stronger wave of gentrification and redevelopment has hit the area, ushering in indie shops, street photographers, and solid food and drink options. , an in-the-works neighborhood complex, is attracting tech startups and larger firms like Etsy (previously housed in an old Gair Company building in Dumbo) and WeWork. With history in our back pocket, we set out on an evening field trip to explore present-day Dumbo. The food. The drink. The character. And the charming cobblestone streets. We start with a Jacques Torres. Photo by / Flickr. We started with an after-work stroll across the Brooklyn Bridge, a popular and picturesque route for getting to Dumbo. 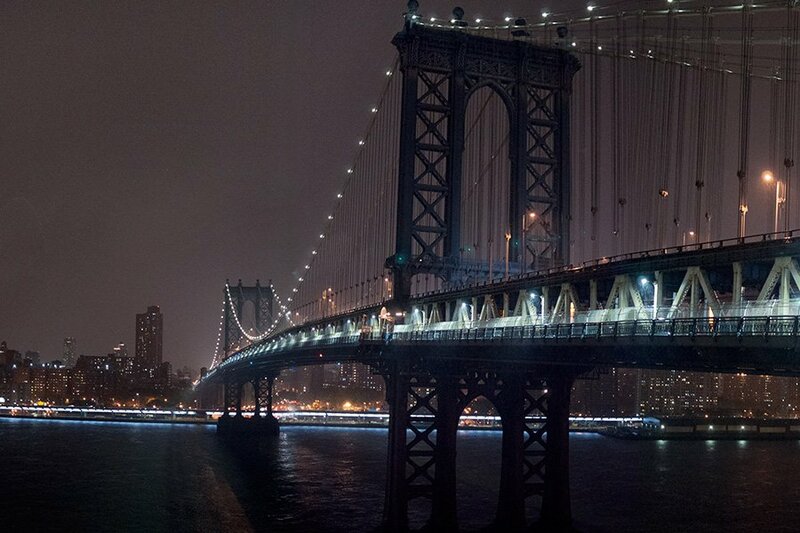 The Manhattan and Brooklyn Bridges anchor the neighborhood from north to south, and either offer a walkable inlet. Most people step off the bridge, stop at for pizza, and turn back home. We walked down Old Fulton Street to Brooklyn Bridge Park, where we marveled at the colossus we had just crossed and the hyper-blond tourists waiting in the heat for scoops. 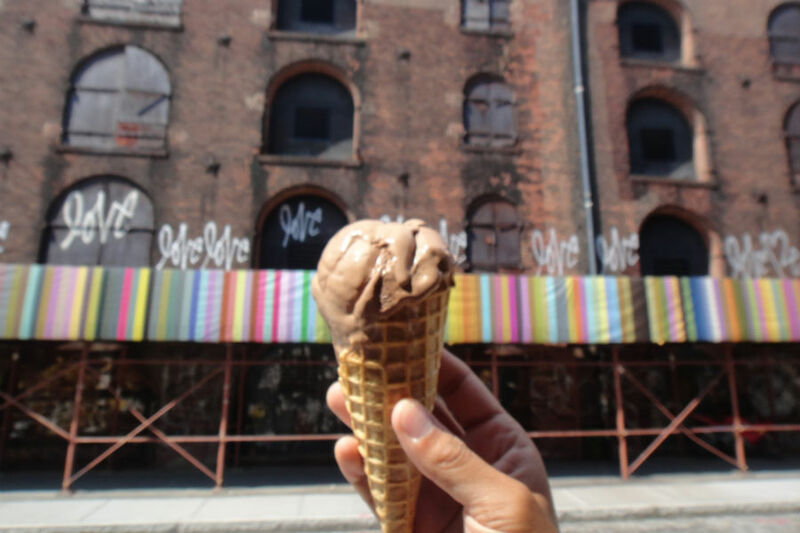 Lines aren't for us, so we headed down Water Street to for a fine chocolate cone and an ice cream sandwich. We "walked off" the sugar rush while watching stylish parents photograph their handsome children in the dimmed 6 p.m. light. We made it one block before slipping into . The spacious bookstore is also part gallery, boutique, and event space, and stocks a nice blend of put-a-bird-on-it-esque Brooklyn paraphernalia, varied literature, and local artwork. We had dinner plans, so we made a mental note to come back to nearby for a show. 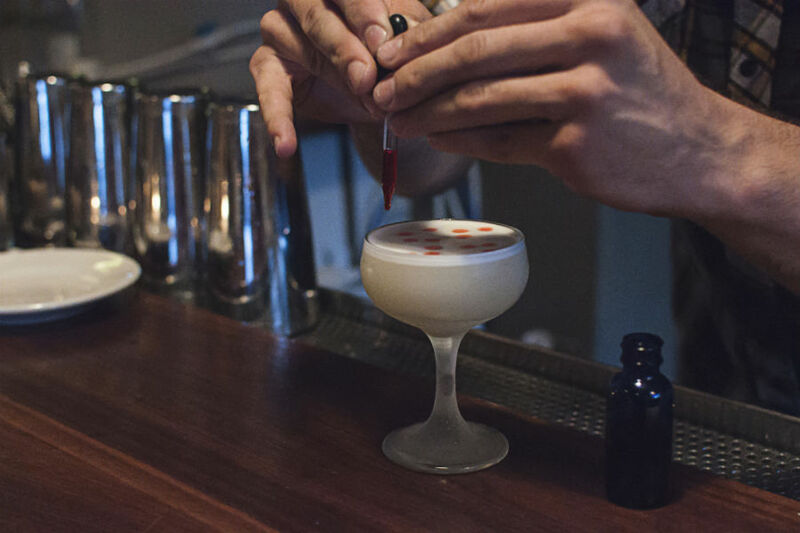 A wine lesson followed by precisely-made, potent cocktails at Atrium. We met with Rachel Aschalew of for food, drink, and conversation. She's a local real-estate agent, website founder, and cheerleader for the neighborhood. She has lived in the area for nine years and runs operations from an office in the epicenter of Dumbo. We went for a liquid appetizer at , one of her local favorites. The restaurant-cocktail bar in the iconic Clocktower Building is airy, with a lush greenwall and charming string lights. Everything is wood-clad, presumably to take full advantage of the natural light that floods the neighborhood. It's very unassuming. We almost walked by the place on the way in. And you'd never guess this approachable man in a polo, seen moments before chatting up diners by the door and now asking us our preference for bubbles at the bar, is a Master Sommelier, former Best Sommelier in America, and one of three DB Bistro Moderne alums that runs the place. Where's the well-pressed suit and tie? The haughty smirk? 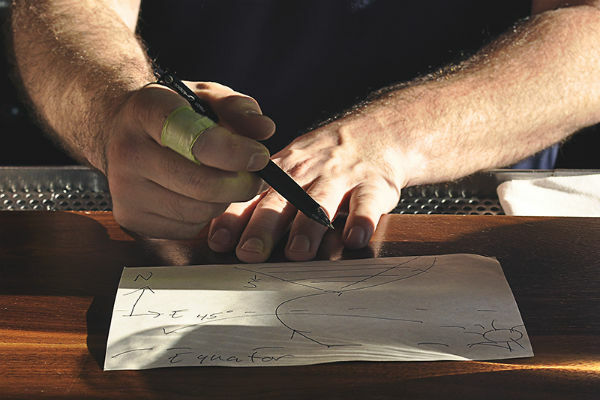 Alex LaPratt, former sommelier at Jean-Georges, just wants to make people feel good. His mantra: With a single sip, you can be transported somewhere beautiful. Like the slopes of eastern France. That's where we were after a quick lesson and a sip from a nutty, intoxicatingly scented white wine from Meursault. Alex stuck around and introduced us to complex, heady liquors, like funky Smith & Cross Jamaican Rum (smelling of hogo, a sulfurous scent emitted from distilling raw sugar cane) in the form of tiki drinks and cocktails you'll want to stare at as they create. Wobbling out of Atrium in search of something to settle our empty stomachs, we stopped, per Rachel's request, at before dinner. The world-famous boxing gym, once home to heavyweights like Muhammad Ali and Mike Tyson, still trains top-tier fighters, although anyone can join the gym. This place is a slice of New York you'd only expect to find in old movies, not amid shiny new lofts. Yet here it stands, in all its past and present glory. WWE fighters drew and diverted disbelieving eyes with the painful sounds of their all-too-real performance. Boxers in training whipped away at speed bags. Between searching for familiar faces on their wall of fame and talking with trainers about old Dumbo, we took a few sobering seconds to listen to the sounds of the gym. Whap. Huff. Thunk. Tat, tat. "Yo Tony!" Crash. Starving but clear-headed, we stopped at . It's like grandma's kitchen, if grandma projected old movies on the back wall and her name was Alfredo. 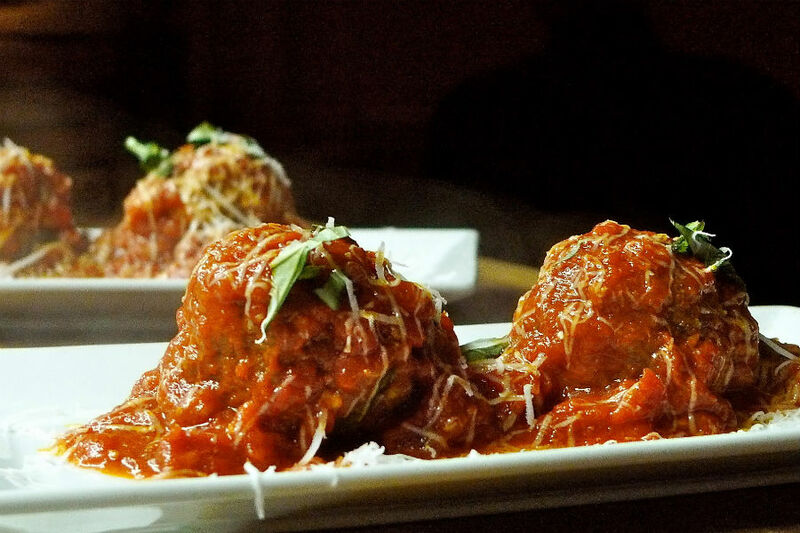 He's the chef, and his meatballs are great. Too overwhelmed by the appetizing menu and too hungry to care, we let owner Marcello order for us. Out came the meatballs, fluffy clouds of honey and truffle-infused mascarpone bruschette, a large stuffed pork chop, and lots more. We told him we were hungry. Al and Mar, both Noodle Pudding alums, can be found shmoozing at the bar with locals or taking shots with lucky diners. It's a community spot. To see old-timers and fashion-forward yuppies stop in for a drink with or just to say hello to the staff was heartwarming. Especially in a neighborhood of emotionless warehouses. What they hold is way warmer than cold brick. To cap the night, we walked unprotected in the pouring rain toward Empire-Fulton Ferry State Park, glimpsed , and took in the sweeping city views before turning home. Dumbo left us feeling good. We felt the history walking in and the good vibes walking out. graciously took us out for a night on the town. Check out their site for events, insight, and all things Dumbo.